As an innovative, progressive and responsible organization serving the energy industry, OSI is highly committed to the environment. As a software company, OSI develops software that is used to manage and optimize renewable energy resources, as well as minimize pollutants in traditional fossil fuel generation plants. OSI's software is inherently designed for energy efficiency, which not only benefits our clients economically, but also has a positive effect of the environment. OSI's corporate campus serves as a statement of our commitment to protect our environment. Great measures were taken to ensure the building and campus are environmentally responsible, a process that has been guided by the adoption of the U.S. Green Building Council's LEED (Leadership in Energy and Environmental Design) program. LEED is a building certification system, providing a structure for identifying and implementing practical and quantifiable sustainable building solutions. Building design, construction, operation and maintenance are all addressed—with the ultimate goal of reducing waste, conserving resources, reducing emissions of greenhouse gases and creating a healthier environment for building occupants. Geothermal HVAC comprises the primary heating and cooling of the building and is provided by high-efficiency heat pumps, which use heat extracted from the earth in the winter and deposit heat in the summer. This significantly reduces the amount of energy required to condition the building. Photovoltaic cells are incorporated to provide a renewable energy source for a portion of the load. Day lighting is achieved through the use of skylights and large exterior windows, minimizing reliance on nonrenewable resources. The design incorporates natural light and views to the exterior from large windows throughout the typical workspace environment. Borrowed light strategies (glass walls) are used at the perimeter. Access to natural light is not only environmentally friendly, it has also been proven to have a positive impact on the physical and mental health of office inhabitants. The project site is located in a watershed district. OSI works closely with city, state and federal agencies to maintain water quality in the watershed. No storm water leaves the site: All runoff is collected and managed on-site. This project also includes restoration of neighboring wetlands. The campus also incorporates prairie restoration landscaping using indigenous plants, which minimizes site disturbance and utilizes natural irrigation. Increased insulation in the exterior walls and roof has been incorporated in the building’s construction to minimize energy loss. Sunshades are provided over south-facing office windows. Solutions to reduce and control electrical usage have been incorporated to optimize energy performance. A central control Building Automation System operates lighting and HVAC equipment according to a building schedule and optimal start and stop times. Lights are controlled using occupancy sensors. Building system monitoring is incorporated to monitor and report on the usage of energy and water in the building. Automated monitors and energy controls are used to optimize the building’s functions, including water, temperature, moisture and ventilation. Schedule and occupancy/luminance sensors control on/off schedules for heating/ventilation/air conditioning (HVAC) equipment, computers and equipment not in use, and enable power-down features on office equipment. All plumbing fixtures are low-consumption fixtures. Water closets, urinals and lavatories are provided with automatic sensor activation. 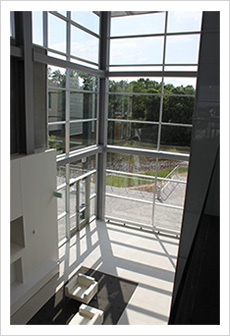 The campus incorporates walking trails, outdoor working spaces and a communal organic garden for employee use.